Yesterday I got myself an early birthday present. In case you don’t follow such the world of Geekdom the new Joker Graphic Novel came out the other day. Brian Azzarello and Lee Bermejo’s Joker has taken my favorite villain ever further, much to my delight and surprise. I could not put it down. The story was great and the illustrations take cues from TDK’s Joker. The basic premise is, the Joker for reason unknown to anyone, has been released from Arkham Asylum cured of his insanity. The Joker finds that he no longer owns what he calls “his city” and makes quick actions to take it back. Told through the experiences of the Joker’s new driver and right hand man Johnny Frost, the novel takes you on a wild gritty gory ride and incite to the Joker’s personality. Never before has the Joker been so humanized and demonized at the same time. This is a must read for any fan of the character. Great stuff…I think I’ll go read it again now! Heroes is one of my favorite shows on TV. From what I’ve heard, season 3 is going to be the best yet, and the premiere is going to blow you away! With the new season coming September 22nd the promos are getting ready to rev up. This is one of the best. I got my copy and I am so excited for the new season to come. Iron Man was created by writer-editor Stan Lee, writer Larry Lieber, and artists Don Heck and Jack Kirby, he first appeared in Tales of Suspense #39 (March 1963). 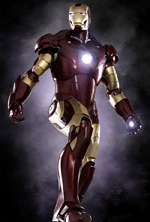 Anthony Edward “Tony” Stark, after being gravely injured and forced to build a devastating weapon, instead created a suit of power armor to save his life and help protect the world as Iron Man. He is a wealthy industrialist and genius inventor whose suit of armor is laden with technological devices that enable him to fight crime. Familiar enough right? Hope I didn’t ruin too much of the movie for ya but lets be honest, I didn’t divulge more than the last 3 trailers and 10 Tv spots. So there you have it. I am going to see Iron Man tomorrow night with the wife, so you can expect a full review on Monday, or Friday night if I am feeling extra geeky and ambitious. In the meantime you should check out the official Iron Man Website and stock up on all the free computer swag, as well as watch some of the extras. So here we go. The moment you’ve all been waiting for. The contest for the Justice League: The New Frontier DVD has begun. Stating now you have until Monday February 25nd @ 9:00 PM EST to invent and dress up as your own Super Hero. It can be any kind of super hero you’d like but points are awarded for creativity. Also extra points will be awarded for dynamic duo’s as well. In other words if you’re a parent and you get your kid(s) to dress up as your sidekick this will tip the scales in your favor. When you have completed your costume, snap a picture of yourself, and your sidekick if you have one, doing something heroic and email it to me at: superman1224@gmail.com. I will post all entries on this blog and announce the winner on Tuesday February 26th, the day the Justice League DVD is released. The winner will receive a free copy of Justice League: The New Frontier for FREE, courtecy of Warner Home Video. Good luck to you all and remember the more creative the better. Any questions email me or post them in the comments.